gr-iridium is a module made for receiving packets from Iridium satellites. One clever idea by the gr-iridium guys is to use an FFT to monitor a whole band and then detect peaks. This makes it possible to receive packets at multiple frequencies at the same time, without having a huge number of baseband processors working in parallel. Peaks in the FFT are discovered by the block fft_burst_tagger. The frequency and various other information is added as a stream tag to the stream. Then the block tagged_burst_to_pdu looks for these tags in the stream and whenever it finds one, it collects a number of IQ samples and stores them in a buffer which is then passed on as a GR message. In gr-iridium, the downstream blocks then operate purely on messages. This means that only “custom” blocks can be used there. Since I like the idea of being able to use standard GR blocks, I implemented a new block, burst_msg_source_c, which then again converts the messages back to a normal stream. This has proven to be a quite useful “technique”. It allows receiving packets at multiple frequencies, even coming exactly at the same time, but having only a standard “one dimensional” baseband processor implemented in GNU Radio. Since the upstream blocks add tags to the stream, it is also possible to keep track of the exact time instant when the packets were being transmitted on air. burst_msg_source_c does the frequency translation for every sample burst so that the baseband processor can stay tuned to the same frequency (baseband) all the time. 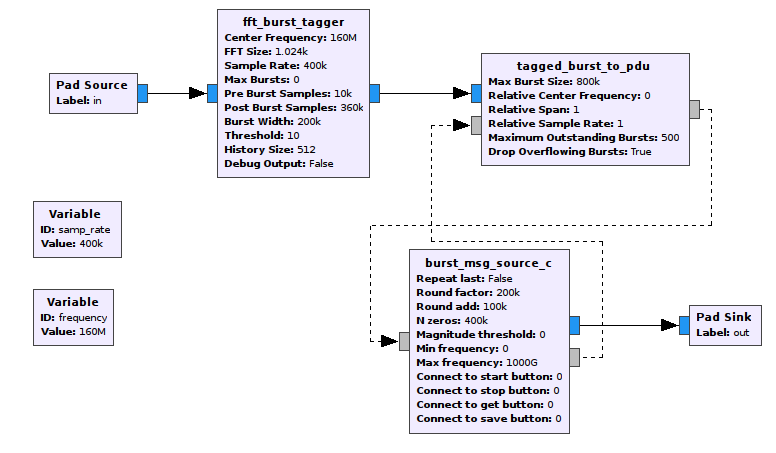 Since the frequency detection mechanism in fft_burst_tagger is not always exact, burst_msg_source supports specifying specific frequency intervals for the channels if such information is a priori known (“Round factor” and “Round add“). It can be seen that the output from burst_msg_source_c will not be at a regular sampling rate. It will come in bursts. Sometimes, if for instance the threshold has been set too low in fft_burst_tagger, the output from burst_msg_source_c will be at a sampling rate much higher than the input! In that case, the handshaking mechanism between burst_msg_source_c and tagged_burst_to_pdu makes it possible to simply drop bursts instead of the whole flow graph hanging (“Drop Overflowing Bursts“).